In Defense of Communism: Anticommunist delirium by Erdogan: He labeled anti-war students as "terrorists"
Anticommunist delirium by Erdogan: He labeled anti-war students as "terrorists"
In a delirium full of anticommunism, nationalism and hate, Turkish President Recep Tayyip Erdogan lambasted anti-war students at Bogaziçi University who protested other students for commemorating soldiers killed in a military operation in Syria. Spreading more nationalist poison, Erdogan promised to clean “communist and terrorist students” out of universities, the Cumhuriyet daily has reported. On March 19 a group of students who disagree with the Turkish government's offensive war in Syria protested a ceremony set in memory of soldiers killed during the military operation in Afrin, Syria. Police identified 17 students and detained five of them, while 12 are being sought. “Those are terrorist youths. We will conduct investigations into them. After identifying them, we will not let them get an education at the universities because a university is not a place for educating terrorist youths. 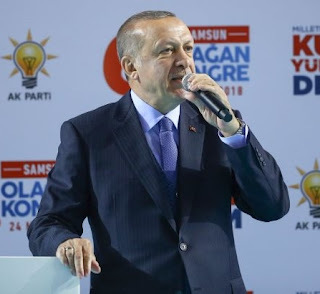 A university educates the generation who will serve their country and nation,” Erdogan said during a speech at his ruling Justice and Development Party (AKP) congress at Yaşar Doğu Sport Hall in the Tekkeköy district of Samsun.